Greenwich Market is one of London's best sources for arts and crafts, unique gifts, and rare antiques and collectibles. There has long been a strong royal connection to Greenwich, going back to the old Royal Palace of Placentia, which was the monarch's main palace from about 1450 to the middle of the 15th century to about 1700. Greenwich is the birthplace of Henry VIII, Elizabeth I and Mary I. There is also a strong shopping connection, with a Royal Charter Market being originally assigned to the Commissioners of Greenwich Hospital in 1700 for 1,000 years. In the main shopping area around the high road, there are lots of places to eat – many good for children – and lots of cute little shops – most not so good for children. See Getting to Greenwich information and a location map. Greenwich Market is in the center of Greenwich, in the covered area surrounded by College Approach, King William Walk, Greenwich Church Street, and Nelson Road. from the West Via Turnpin Lane and Durnford Street. Use Journey Planner to plan your route on public transport. Market shops and pubs are open all week. Avoid the weekend if you want to visit with children in buggies as other days are quieter and you are more likely to be able to fit in the local cafes and restaurants. The Coach and Horses is a local favorite; its seating area actually forms part of the market. 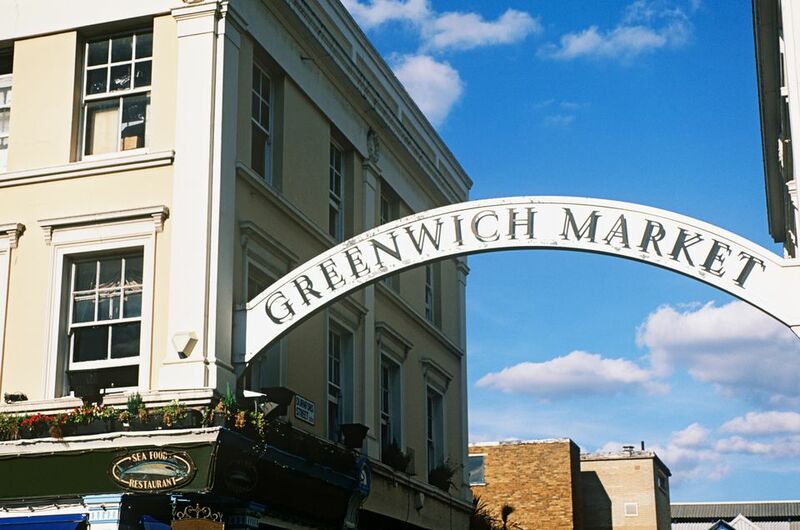 Greenwich Market management gives priority to traders who design and make their own products, as well as specialist ethical importers. Some stalls are there every week but there are a lot of casual traders so every visit to the market is different. It also means, if you see something you really want to buy, don't rely on going back next week to get it. The market management works hard to keep a good mix of products on sale so the market always feels fresh and exciting. On weekends you can expect to find up to 150 arts and crafts stalls and up to 25 food stalls. You may also enjoy seeing the list of Where to Buy Antiques in London.